With the next version on SharePoint due sometime during the second half of this year, it’s good to hear that Microsoft are still very much continuing to provide an on-premise version. There’s been a lot of chatter recently about this being discontinued but it’s still a kicking and a screaming. See this post from earlier today – Evolution of SharePoint; definitely worth a read. A useful script for running on your dev\uat environments to free valuable disk space. The crawl store database can grow quite significantly over time. Write-Host "$dbName has been shrunk"
Write-Host "$dbName does not exist"
Comments in the script should make this one clear to understand, happy coding! 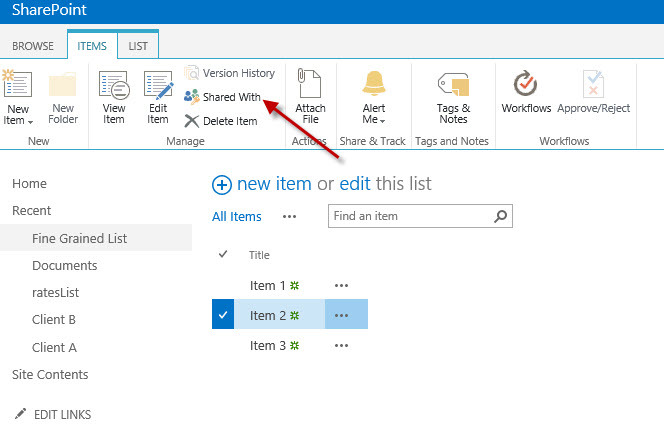 Setting item level permissions was straight forward in SharePoint 2010, you selected the items you wanted to break inheritance on and selected the Permissions item. When moving to SharePoint 2013 and trying to do the same thing, to a lot of users this functionality appears to no longer exist. Worry not! To set item level permissions for an item (or multiple items) select the candidate items and switch to the Items tab in the ribbon. Notice the ribbon item called Shared With. This is what replaces the Permissions item from 2010. Click it and a list of users that the item is shared with loads. Instead of adding new fields to a content type or list creating the object (SPFieldText, etc.) and adding it, simply pass the XML definition for whatever field you are looking to create into the AddFieldAsXml method of the Fields collection. // and then update it. The xmlDefinition is simply a copy of the Field tag, for example from a content type definition.